REPORTS of Johnathan Thurston's downfall as an NRL superstar have been greatly exaggerated. "JT" has borne the brunt of the criticism for the Cowboys' tepid start in 2018, but statistics show the North Queensland champion is still one of the game's elite playmakers. According to Fox Sports Stats, Thurston, who turned 35 on Wednesday, ranks second for try assists this season, with nine from seven games, behind only Dragons star Gareth Widdop (11), who has played an extra game - in his side's Anzac Day win over the Roosters. Thurston is also second for line- break assists, with eight, equal with halves partner Michael Morgan and behind comp leaders Widdop (10) and Manly enforcer Jake Trbojevic (10). Thurston's performances fly in the face of how some commentators have judged him in his comeback from a serious shoulder injury, with Penrith great Greg Alexander even suggesting the star halfback may have played a season too long. Injuries restricted JT to just seven games last season. Having posted eight try assists and five line- break assists in that time, he has already improved on that output this year. 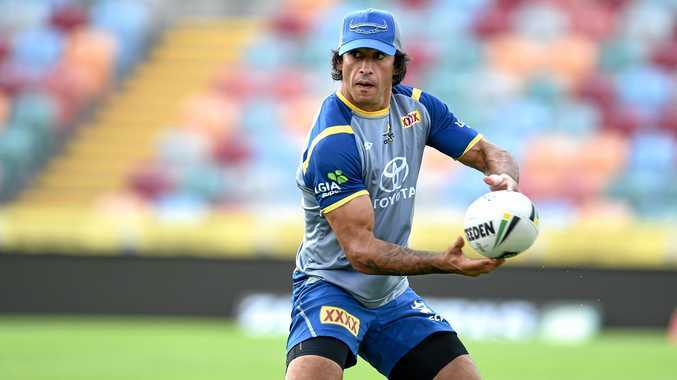 Thurston has looked every bit of his 35 years when picking himself up after a big hit and has admitted it takes his body a lot longer to recover after games. But that hasn't dulled his effectiveness with the ball in hand and Cowboys coach Paul Green is confident the four-time Dally M winner still has plenty to offer in his farewell season. "I think he's been good. He hasn't been at his best, but I think that augers well for us because he's too good a player not to get back to his best," Green said. "You look at the stats and where he sits in terms of try assists and line- break assists and he's still capable of playing better. "I think our players have been pretty good at not buying into any of that talk (criticism) and making sure that they understand what their own role is and focusing more on that. "There's improvement in all of us and him (Thurston) in particular. I think the more footy he gets under his belt the better he'll get." "I guess it's easy to point the finger at him (Thurston), but I think when you have a proper look at it he's doing pretty well," Morgan said.